“As much as things change, they stay the same” couldn’t have been said better by my former teacher and now friend Randy Becker. A tour of my first studio last weekend brought back a rush of memories as the room itself remains uncannily familiar, essentially unchanged in the 12 years since I left. 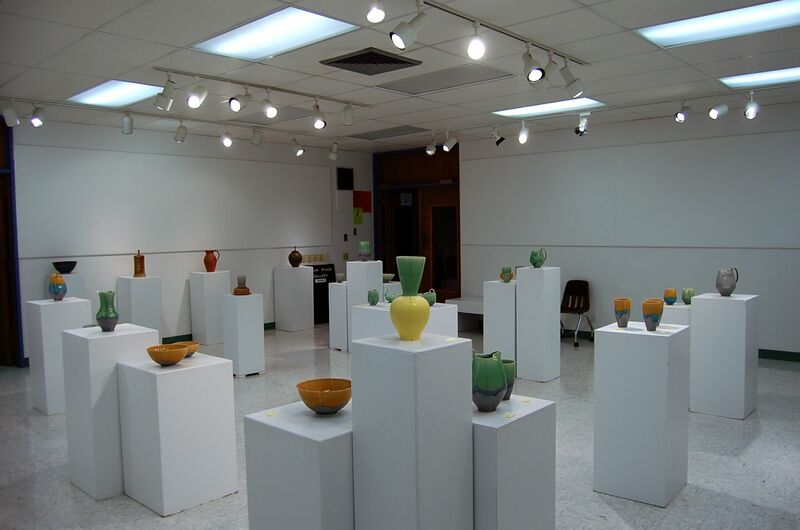 I am just returning from a trip up to Wisconsin to set up a solo exhibition at my old high school and thought I would share some images and a little bit of a background story about my initiation into the ceramic world. I think I would have become a ceramic artist eventually, regardless of what my experiences were, as I have always been fascinated with clay. One of the first sentences I wrote back in first grade said “When I grow up I want to be a sculptor”. 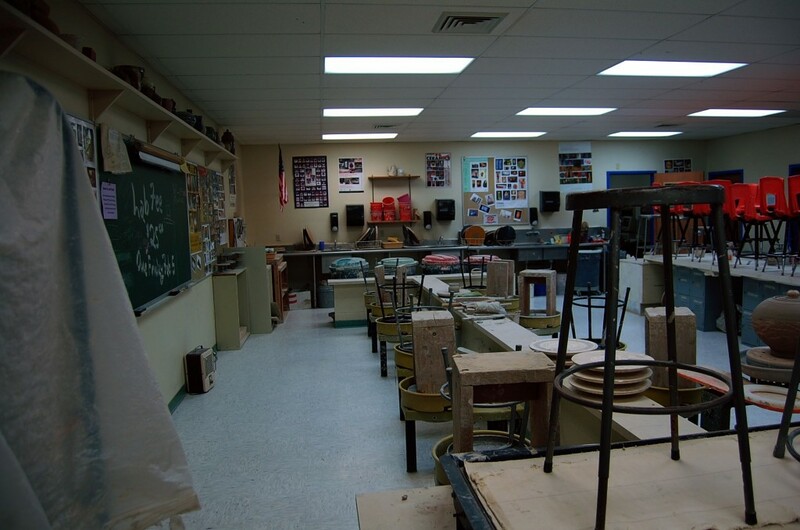 It was just my luck, however, that the public high school I attended had one of the best equipped and most successful high school ceramic art programs I’ve ever seen or heard of. This was at Verona Area High School, just outside Madison Wisconsin. Through some luck and a lot of hard work, determination, and community engagement, Becker was able to build this program over the years into what it is now – a rare and wonderful place for students, whether they want to become artists or not, to enjoy a creative endeavor. To take a break from the rest of it and solve some problems in a different way. Let’s take a tour shall we? The main studio space has pretty much all the things a studio needs – 10 wheels, stacks of bats, buckets, slab roller/extruder, wedging tables, shelves, and work tables. Classes are split, with half working on tables, and half on wheels. Halfway through the semester the groups swap. I tried doing this with a class at IUS, and now have a much greater appreciation for what this requires of a teacher. One thing I remember quite well about my time in this studio was the visiting artists that came in and gave workshops. During my time there, I can remember such artists as David Dahlquist, Peter Hayes, Winthrop Byers, Bruce Breckenridge, and even Don Reitz coming by to give workshops. I never quite realized how amazing that was until I learned who all those people were later on in my education. The glazing and firing situation at the studio was fantastic. 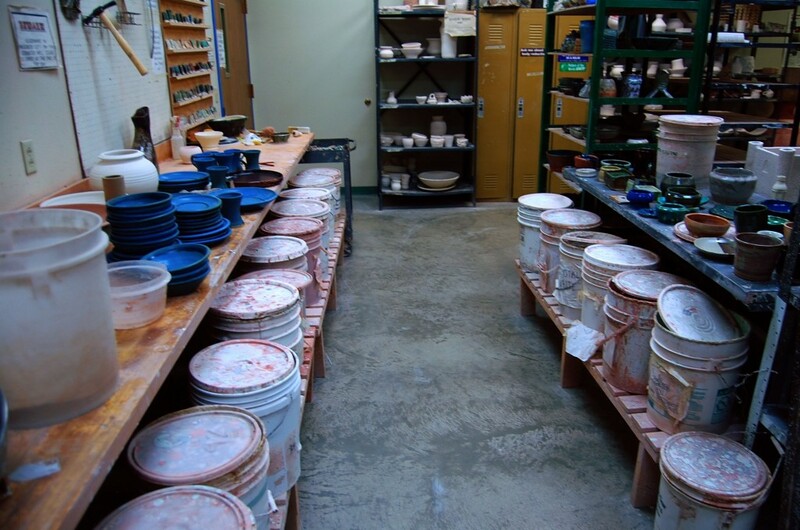 Becker is an avid researcher of glazes, and accordingly equips the studio with a huge variety and quantity of glazes for cone 10 reduction AND oxidation. Some glazes work in both for different effects, and others work only in one or the other. I remember towards the end of my time there getting special permission to test my own glazes, and even got to mix up a bucket of my own. 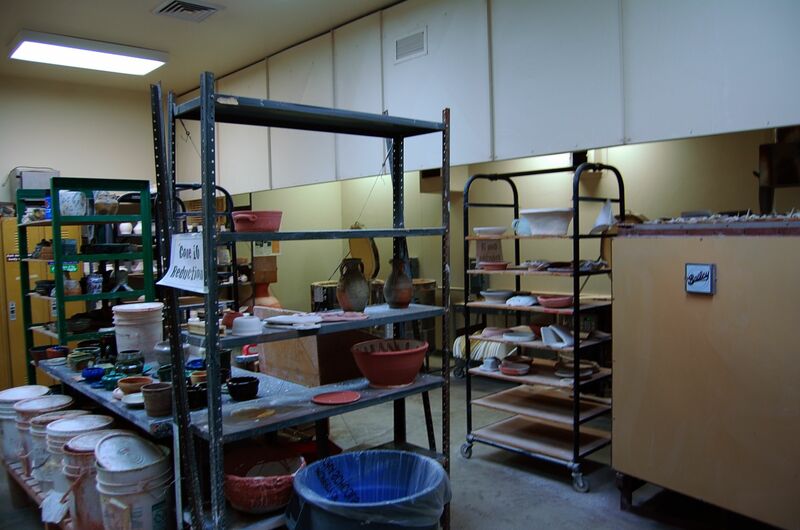 In addition to these kilns pictured, students were invited and encouraged to participate in wood, salt, raku, and wood/salt firings at various studios in the area, including Randy’s own kilns. I remember a few incredible experiences hanging out stoking kilns with a bunch of local artists. A lot of my best work from high school came out of those firings. If I didn’t keep myself busy making work, I would get sent to the mixing room to knock out a batch of clay. We were on the all-you-can-eat clay policy, which meant that the 100 plus students that used the room every day went through a couple batches, every day. I remember feeling sorry for the student teacher who seemed to be constantly running that thing. 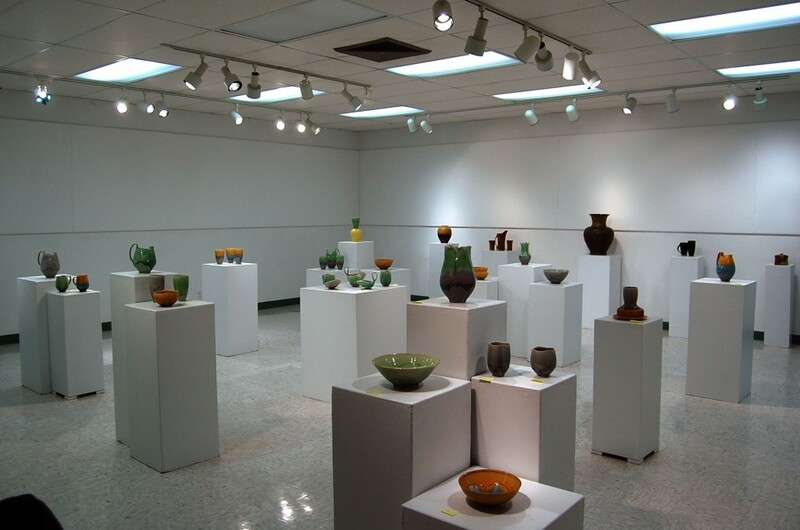 In addition to the studio, the school has an art gallery. Local, national, and international artists show work throughout the semester. Collectors Colleen and Dennis Bindley would show part of their collection once per year. Once, Dennis came in to give a talk about the collection. He passed around a pot for us to handle. When it returned to his hands he told us that is was a Hans Coper piece worth about $30,000 at the time. He then told us the legendary story of Coper and Lucie Rie. That experience is seared into my mind now, never to be forgotten. At the present moment, my own show is up in that gallery. Being a homecoming experience, I decided to make the show partially retrospective. The center of the gallery shows my current body of work while the perimeter houses work made while I was in high school, with a few pieces from various stages of my development through undergraduate and graduate school to bridge the gap. 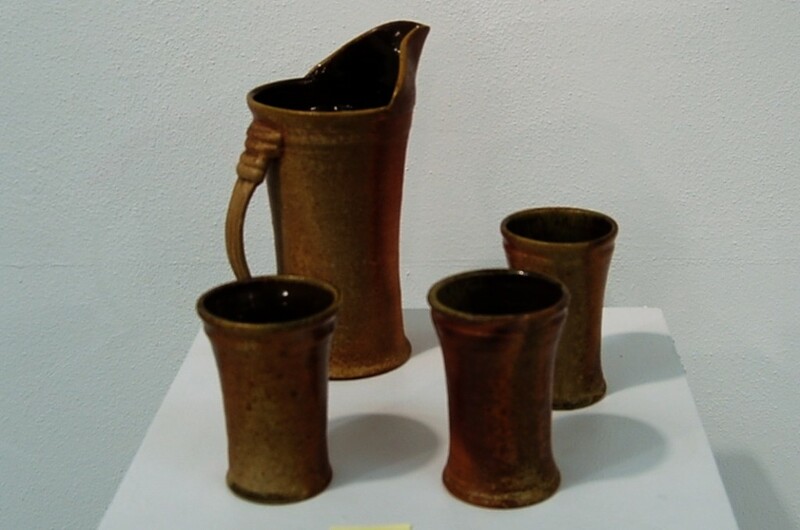 This pitcher and cup set, a prized possession of my parents, was made during my senior year of high school. It was fired in Becker’s wood/salt kiln on his friend Don Hunt’s land. I went out there with a couple friends and hung out stoking the kiln with a some locaI artists and UW Madison students. It came out quite nice, so Becker shot a slide of it and entered it into a show – the First Annual K-12 Exhibition at NCECA, in Dallas. Don Reitz, the juror for that show, awarded it with the best of show, pretty much finalizing my choice to become a ceramic artist as a career. My friend Shannon Sullivan, who graduated with me, was also awarded an honorable mention. She is now an accomplished ceramic artist and tenured professor at the College of the Redwoods in California. We are just two of the dozens of professional artists, teachers and graduate students to come out of this program. One thing I really love about Becker is that he says we were the easy ones. 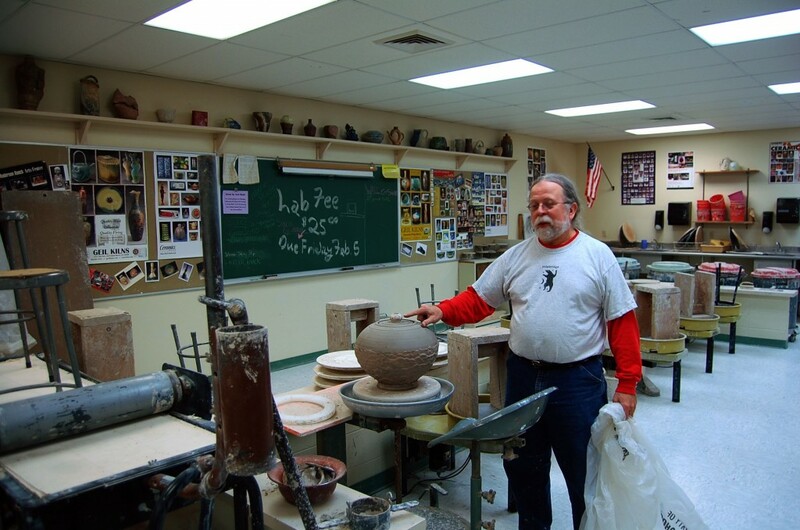 His real work is with the students he knows wouldn’t come to school at all if not for the ceramics class. He reminded me over lunch that teaching is a lot more than just sharing skills. A good teacher will help others become better people, and maybe on the side the students will learn something about clay. Even today, he is still my teacher. What a great post! Thanks for sharing your roots Jeff. I’m always curious about the spark- I’m hoping that I’ve been able to create a few in my years teaching ceramics. I also love seeing that studio space and gallery! How cool is that? If only we knew what a good situation we had when we were back in school :) Thanks for sharing! Thanks for sharing this story about your ceramics journey. I am always so impressed to hear about the great things that Mr. Becker’s former students are doing ! I’m going to stop by the gallery later today to check out your show. I really like the green and tan vase you have pictured in this post. The colors and texture are stunning! Wow how’s that for a blast to the past? The room looks exactly as I remember it. I remember how shocking it was to go to UWW and see how there was LESS pre-mixed glazes available than we had in High School. Wow dude, a wall of memories just hit me. Thanks for sharing. Its crazy how much this reminds me of my highschool. Because I am still in highschool this is a great realization of how rare the opportunities I have are. I have, on multiple occasions, been able to fire at several woodfired kilns in my area. I also am able to test and make whatever glazes I want, and have also recently been able to take on a kiln building project with all expenses paid for by the school. Awsome post, I enjoyed reading it very much. hey jeff, great post… glad to see the infamous clay shop that you started in. i have to admit it surpasses anything i had in my mind. 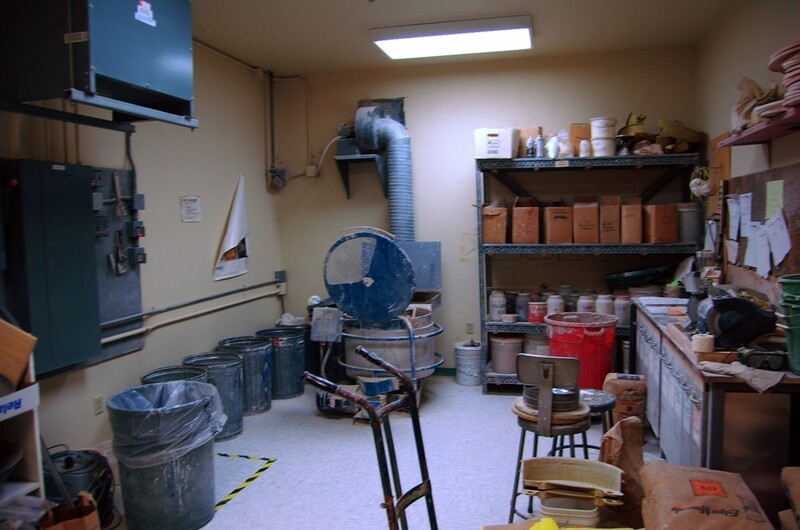 it’s mindblowing that this is a high school ceramics lab… i’ve seen much less well-equipped at the college level. the show looks great, when i first looked at the pics before reading the post i was curious if that big piece against the wall was one of yours. I have classroom envy! I am so gonna show this post off at work. I have a hard time even getting buckets for my classroom. Sigh, so glad to see they are doing it right somewhere! Your former teacher sounds fabulous, we need more like him in the school system. So rare to see in a H.S. Kudos to that school district for knowing the importance of the arts in childrens lives… and of course to that dedicated teacher! Wow, this is your HIGH SCHOOL ceramics department? I am beyond jealous. Congrats on the show, it looks lovely! I really enjoyed reading about your beginnings. What a blessing to have a passionate teacher and what looks like an incredible high school ceramic dept. And to think your high school celebrates the arts with a gallery, amazing in these times when art is getting cut from many curriculums. Loved your high school award winning pitcher and cups. Very cool to be exhibiting where you learned! I’m got an art ed degree partially because of the inspiration of Mr. Becker, he’s an amazing guy! I always enjoy seeing your work! Your post (which is so nicely written and photographed) pays tribute to Mr. Becker and the power of teaching as does the wonderful art you are making. It’s so cool that you have expressed gratitude about your VAHS experience. Randy Becker is an original, and I consider myself lucky to have taught with him (and so many other remarkable teachers). Thank you so much.